Two Palestinians, one an elderly woman, were killed as Israeli troops launched deep raids into the Gaza Strip targeting militant strongholds. Armoured vehicles backed by infantry poured into the Zeitoun area of Gaza City, sparking clashes with militants. Sadia Haraz, 70, was killed by Israeli tank fire, medics said. A 26-year-old militant was also killed by troops. Hours later a rocket fired by militants exploded in the Israeli border city of Sderot, seriously wounding one man. The Israeli military frequently launches raids into Gaza, to stop such rocket fire. Palestinian militants say their attacks are to retaliate for deadly military action by Israel. The rocket aimed at Sderot fell a few hundred metres from a car carrying the UN high commissioner for human rights, Louise Arbour, who was visiting the town at the time. Israeli troops entered Zeitoun, on the east edge of Gaza City, during the night and took up sniper positions on rooftops. The home of a Hamas commander, Wael Hassanin, 26, was stormed after troops called for him and his brother Ibrahim to surrender. Mr Hassanin was shot dead. Witnesses say his brother was arrested. The Israeli military said other operations took place in the heavily populated Jabaliya refugee camp, and the town of Beit Lahiya. The incursion was launched hours after an Israeli missile strike in Gaza killed two Palestinian militants and injured at least four other people, including children. In the West Bank, the Israeli army said its soldiers had shot dead a 17-year-old Palestinian who had approached them with what later turned out to be a fake gun. Ms Arbour's convoy was pelted with stones by angry residents of Sderot, an economically depressed Israeli town which has borne the brunt of rocket attacks that have killed nine people in southern Israel in recent years. She said the protection of Israeli and Palestinian civilians caught up in the conflict was "an absolutely critical issue". The rocket landed several hundred metres from her car, her spokesman said, adding that the UN delegation "heard very loud explosions" and saw two plumes of smoke. "I want to express my sympathy to the family of the person who was wounded, to say how much I share their sense of hopelessness and vulnerability and frustration at being so exposed," Ms Arbour said. On Monday, she toured Beit Hanoun, where Israeli shelling killed 19 Palestinian civilians two weeks ago. Israel said it had made a targeting error. Earlier this month the town was also the target of major Israeli ground offensive that left 80 people dead. "I saw civilians, mothers, who lost their children, who feel... terribly exposed, terribly vulnerable, extremely afraid, very abandoned and I have a sense there is the same thing here [in Sderot]," Ms Arbour told reporters. Israel pulled settlers and military bases from Gaza last year, but the military renewed ground operations after militants captured an Israeli soldier in a border raid in June. Since then, Israeli troops have killed about 400 Palestinians in Gaza, roughly half of them civilians. 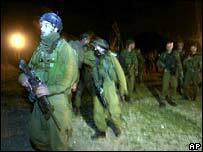 Three Israeli soldiers have been killed and a woman in Sderot has died in a rocket strike.